Only a detailed and expert analysis is a guarantee that honey is all natural and organic. But, if you want to know whether the honey you just bought is natural, try these simple tricks. 1. Carefully Read The LabelThis is the very first step that will help you choose the right, additive-free honey. Producers are obliged to label the content and the percentage by a certain amount. This is a good trick. Take some honey and rub it between the tips of your finges. Real honey will absorb in your skin easily. If the honey remains on your fingers and sticks, it means that it is loaded with sugar or artificial sweeteners. Heat a few teaspoons of honey in your microwave. High heat works fine. Real honey will eventually caramelize, and fake honey will become all foamy and bubbly. Put a few drops of honey on a sheet of paper. If it does not absorb in the paper after a while, you have got some natural honey. Fake honey contains a lot of water and it will absorb in the paper right away. Ants do not really fancy natural honey produced by bees. Put some honey in a corner, and if ants do not touch it at all, you have bought some real honey. This is probably the easiest indicator of your honey’s content. When soaked in water, real honey makes lumps and falls to the bottom. Fake honey melts. Pure honey tingles on your tongue. 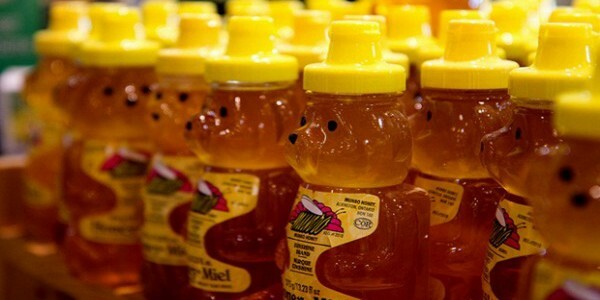 Fake honey has almost no effect on the palate. Spread some honey on a slice of bread. If the bread becomes too hard, your honey is all natural. Fake honey will only dampen the surface of the bread, due to the large amount of water in it. Separate the egg yolk and stir in some honey. The yolk will look like it is fully cooked only if the honey is natural. Real honey crystallizes after a while, and fake honey will keep its liquid, syrup-like composition.